What do you do if you're an inspector at Los Angeles International Airport and you spot a middle-aged man stepping off an airplane with bird droppings on his socks, and bird tail feather's sticking out from the bottom of his pants? Apparently, if this is the same guy who in December abandoned a suitcase at the airport with 18 exotic smuggled birds in it (five of them having died in transit) you arrest him on the spot. 46 year old Sony Dong was charged on Tuesday with smuggling birds from Vietnam into the United States in a most unnatural migration. In March, Dong devised a pair of leggings to hold three red-whiskered bulbuls, four magpie robins and six shama thrush and boarded a plane to the US. "Magpie robin" is a fairly generic name for several species of birds so I 'm not sure which he had. 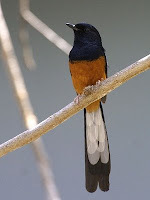 The Shama Thrush is also known as the White-rumped Shama. Shama's are no longer considered part of the turdidae (thrush) family. According to U.S. attorney spokesman Thom Mrozek, the birds sell for approximately $400 in the US. His "business associate," Duc Le, was also arrested when they found 51 songbirds at his house. Now I don't know which birds he had at his house but if we assume about $400 per bird we're looking at $26,400 worth of birds. Red-whiskered bulbuls are listed as a species of least concern on the IUCN Red list. They are popular as cage birds as they are fairly easily caught and can be taught to sit on the hand. In the wild they feed on fruit, nectar and insects and prefer to live in lightly wooded areas or open country. They are naturalized in several parts of the US, likely from escaped pets. They can be found in Los Angeles, Hawaii and Florida. Shama Thrush aka white-rumped shama listed as a species of least concern on the IUCN Red list. They are native to South and Southeast Asia though they were purposefully released on the Hawaiian islands of Kaua'i and O'ahu. They are popular cage birds because of their song. I've flown with a toddler and I know how difficult and noisy a process that can be. How uncomfortable was it to fly from Vietnam to Los Angeles with 13 birds strapped to your legs? Didn't they make any sound? What a strange world.